Last week saw a film that has made news headlines of late (but for all the wrong reasons) take the number one spot at the box office in mainland China. 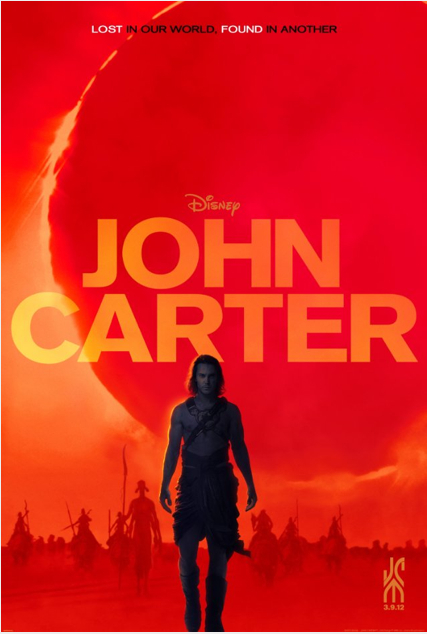 John Carter, which Disney announced will result in a massive $200 million loss for the company, succeeded in usurping Stephen Spielberg’s War Horse at the top of the Chinese box office, taking in a solid $14 million over its first three days of screenings. John Carter easily outdistanced the Hong Kong/China co-production A Simple Life, which earned $3.5 million to hold on to the second spot for the second week in a row. Debuting at number three was the Hong Kong action/thriller Nightfall, starring Nick Cheung, which earned $3.1 million in its first four days. War Horse dropped three spots to number four, earning $2.6 million for the week, while Jason Statham’s action film Blitz (2011) debuted modestly to capture fifth place with $1.5 million over four days. For the first time in six weeks, Journey 2: The Mysterious Island landed outside the top 5, collecting $1.4 million to raise its China cume to an impressive $58 million, or nearly 20 percent of the film’s worldwide revenue. Although John Carter was a drastic under-performer for Disney in the key North American market, the film opened extremely well in China. Carter’s $14 million debut ranked third amongst all opening weekends in the PRC this year behind Mission Impossible’s $15.7 million 2-day haul in late January, and Journey 2’s $15.2 million over three days in early February. More and more often China is becoming Hollywood’s biggest international territory, which goes to show just how strong the “Made in Hollywood” brand is there. In his book As China Goes, So Goes the World: How Chinese Consumers are Transforming Everything, author Karl Gerth describes the rapidly evolving Chinese consumer culture. Gerth contrasts David Ogilvy’s visit to China in the early 1980s with the PRC’s consumer market of today. Thirty years ago, Ogilvy encountered a country with a near-total absence of advertising, and what advertisements there were contained little more than technical information, with no evocative images of the products to pique the interest of potential consumers. However, unlike in the United States, where ultimately it is left to the individual company to create its brand identity, in China, the central government views the development of strong national brands as an issue of national economic security, and thus takes a hands-on approach to the ongoing development of Chinese consumerism. Gerth mentions that Chinese officials are hoping to emulate Japan’s success in rebranding its national products. Today, the “Made in Japan” is a signifier of quality and excellence in consumer goods, but this was not always the case. Forty years ago, a consumer product labeled “Made in Japan” would have been viewed as inferior to its American counterpart. China’s current situation with its national brand identity is quite similar in certain ways to Japan’s forty years ago, but it remains to be seen whether China can successfully rebrand itself. There are a few internationally recognized Chinese brands that signify quality, Lenovo being one of them. But one need only look back over the past few years to be reminded of big scandals involving Chinese goods that have done more to sully the “Made in China” brand than any successful Chinese brands have been able to help elevate the global reputation of Chinese products. And so perhaps it might be helpful for those of us in the international film scene to look at what is going on with China’s film industry and theatrical market within the broader context of what is going on with Chinese consumer goods and culture in general. After all, for Chinese consumers, the preference for things made in the West extends far beyond movies, and the Chinese government’s film quota system and film co-production rules can be viewed as being very much in line with the tariffs and regulations that Beijing places on imported goods in other industries as well. Many Chinese consumers meanwhile are caught between their general desire to support Chinese businesses and their genuine fondness for American and other Western consumer goods, and it will be interesting to see if and when the brand “Made in China” will start appealing to mainland Chinese consumers just as much as “Made in America” does today. This entry was posted in Analysis, Box Office Reports and tagged "Made in China", A Simple Life, Albert Wang, As China Goes, “Made in Hollywood”, Blitz, David Ogilvy, Jason Statham, John Carter, Karl Gerth, Nick Cheung, Nightfall, Rob Cain, Robert Cain, So Goes the World: How Chinese Consumers are Transforming Everything, War Horse by chinafilmbiz. Bookmark the permalink. But in whose hands is all this B.O. money really ending up? I spent the better part of three weeks in China in 1988, and I imagine I wouldn’t recognize many of the places I went. I remember being surprised even then how prevalent US brands were. And I’m fascinated by China’s political organization. There’s no way you integrate a market economy and still have communism or socialism. You can CALL it either of those, but it isn’t. Your statement that “the central government views the development of strong national brands as an issue of national economic security, and thus takes a hands-on approach to the ongoing development of Chinese consumerism” is pretty interesting. On the one hand, that could be a savvy approach to maintaining power, recognizing that a strong economy where the maximal amount of money stays in the country eliminates one of the most common causes of social unrest. And consumerism functions pretty well for keeping people’s minds distracted from real issues. On the other hand, encouraging people to want more material possessions carries the danger that they’ll want more of intangibles like freedom — especially if they perceive that in the West those two go together.